Other goals are aesthetic and thermal. Polished concrete, is cold on the feet. Ideally, the floor will have enough R-value to insulate warm feet from the earth’s 55 degrees when it’s warm, but not so much that when that it blocks the indoors from the earth thermal mass under the floor. A wood-like finish is another goal. Ideally the result will be a “sand-able floor” with an R-value of 3-4. After the forest fire, I have a LOT of dead standing trees. and wood chips are nearly free. 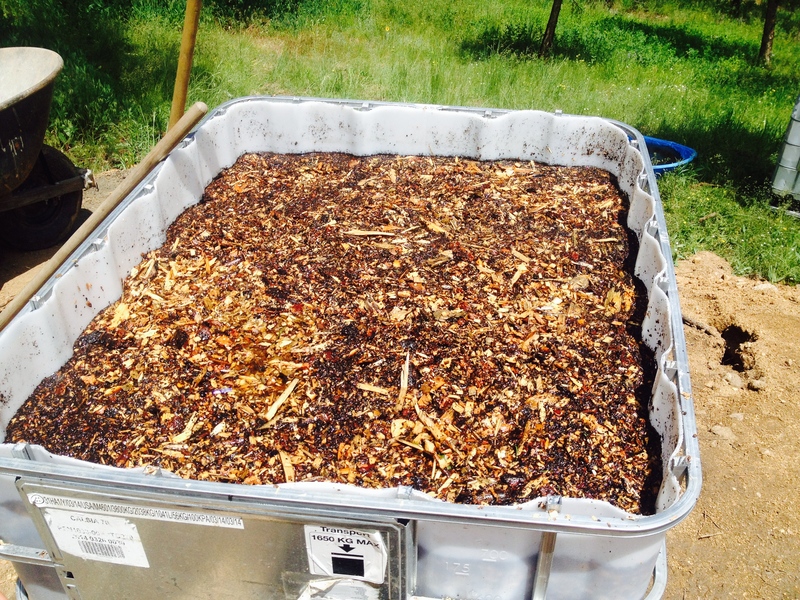 The cost to produce about 30 cubic yards is about $300 to rent a chipper for a day. The thought is to use those wood chips as the bulk material for concrete. 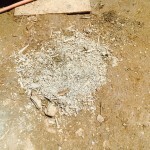 Batch 0 – A pile of wood chips with some gray cement mixed in. Cement did not set for some reason. 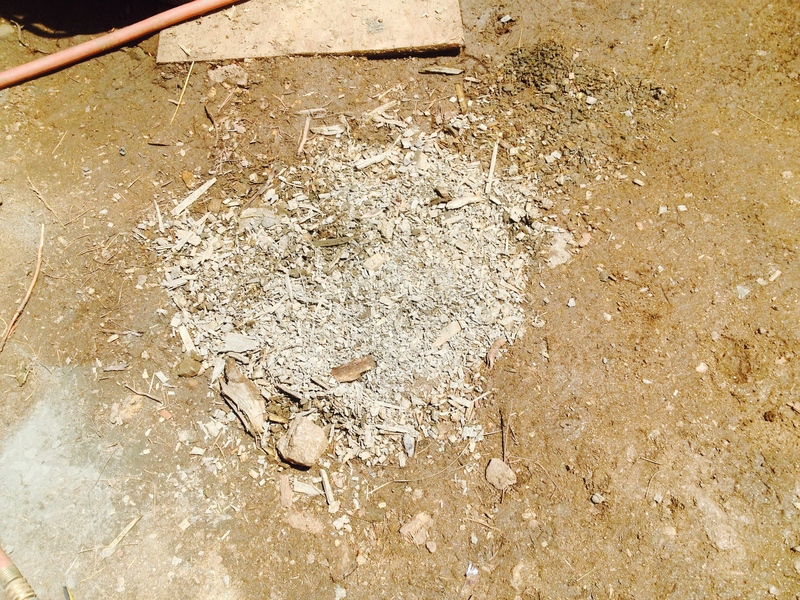 Result: Dumped out bucket of wood chips the following morning with semi-set cement layer at the bottom of the bucket. Cement paste-hard and did not set. 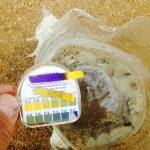 pH test of soaker bin showing very acidic character of wood chips. This is probably why the cement would didn’t set. Was the cement neutralized by an acid? 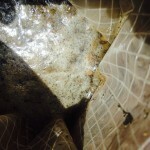 Picture of sample form showing bubbles that appeared on the surface. CO2 from acid base neutralization. 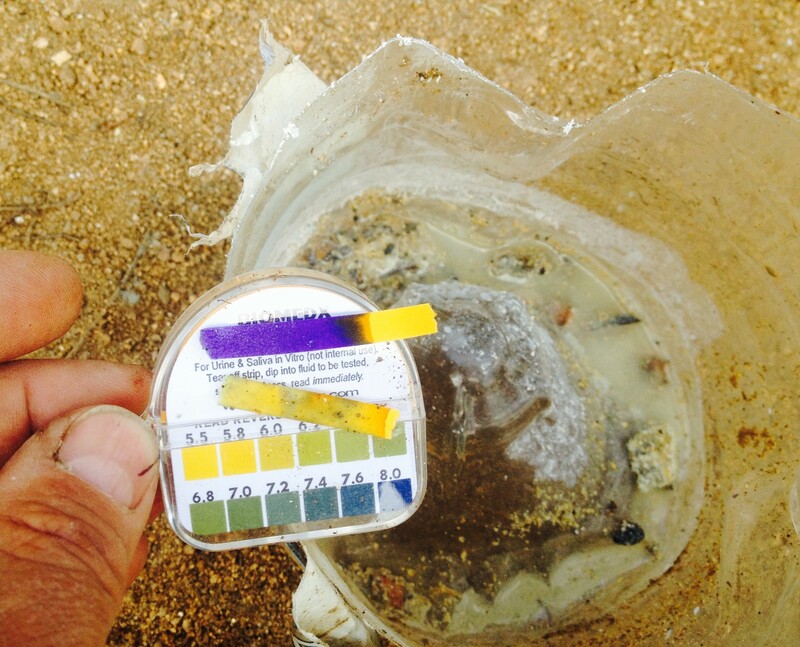 Yep… The pH of of the soaking hopper was about 4.5 – very acidic. Cement is very alkali. The wood acid was neutralizing the reaction and creating gas bubbles in the mix. Both were problems. This was probably why the cement in the Experiment 1 never set up. There was enough acid released from the wood to neutralize/inhibit the cement chemistry. 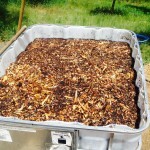 Soaking hopper – IBC tote full of water-logged wood chips. 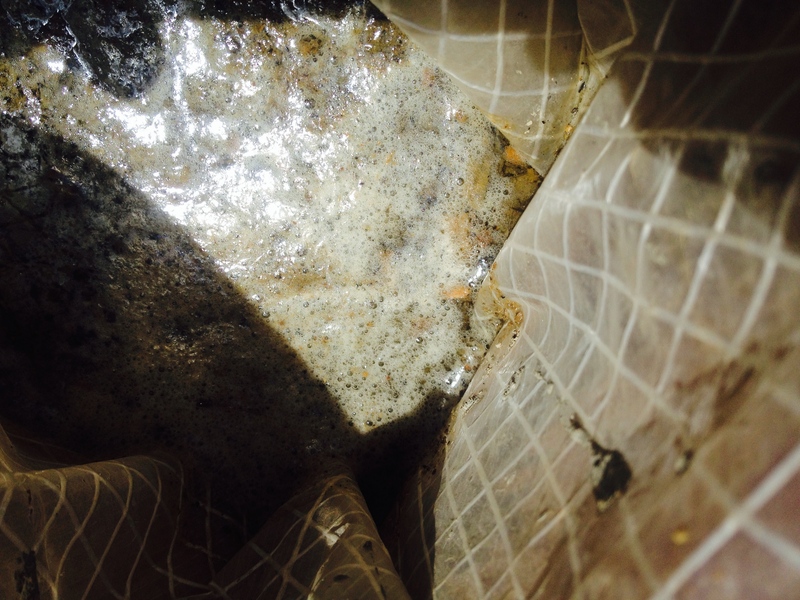 A bigger problem is probably that only part of the bubbles were coming out of the surface. If the mix cured – it would be full of bubbles and probably weak. 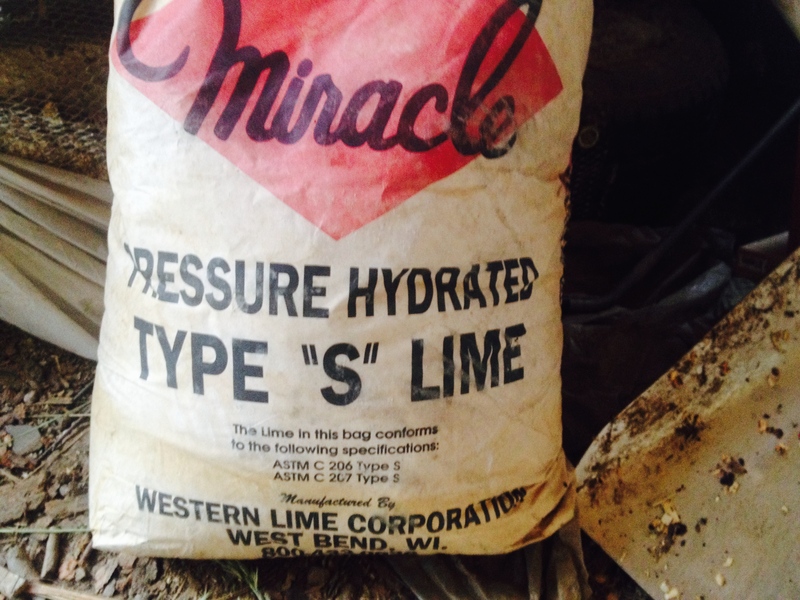 My reserve bag of agricultural lime. How could I neutralize the wood acid… Searched the internet for wood chip cement and found these references. Both these pre-processed the wood chips with an alkali substance, specific quicklime or MOP. 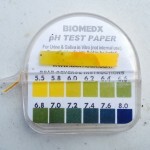 pH and sample of wood chip and lime. 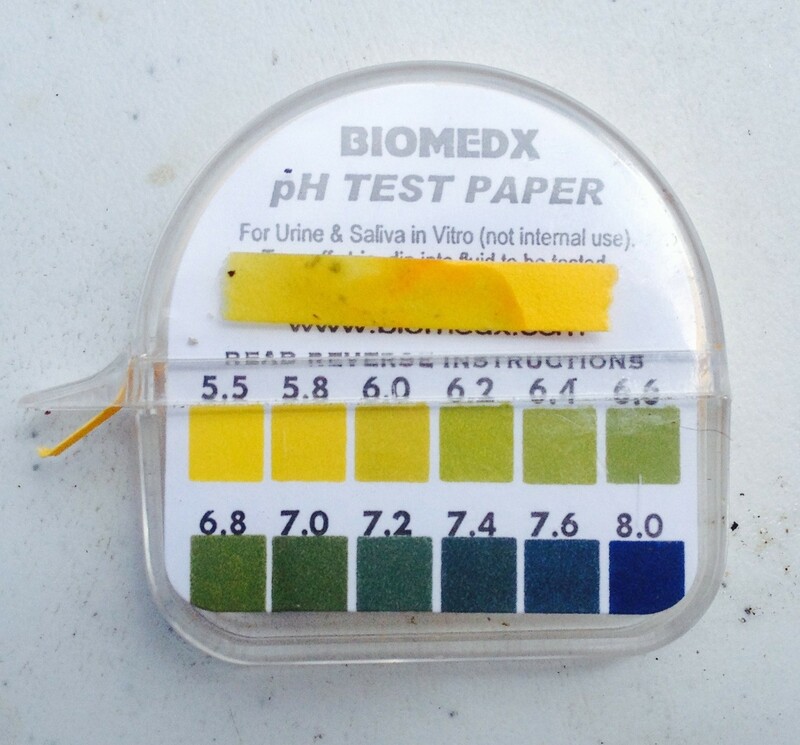 Note bubbles in sample and deep-blue alkali pH > 8 on test strip. No more acid. Mix wet wood chips & sawdust with lime so lime coats the particles (concept is to apply alkali to surface of wood to neutralize organic acids (tannins, etc.). 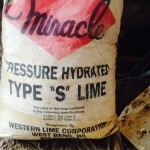 The lime is very sticky and adhered well. Water to mix to slurry. Waited 20 min to inspect for bubbles. No bubbles in the cement this time. The mixture is warm to the touch and appears to be curing. Back to the math. A 80 lb bag of cement is about $11 at Home Depot, and each bag is good for about 6 cubic feet versus 27 cubic feet per yard. This means each cubic yard of concrete will require about 5 bags = $55 in cement. Oops! Concrete delivers at about $90 dollars per yard – the math just blew up. When the DIY materials get to about half of the easy way – the experiment is in trouble. This happened when the batch size went over about 7 yards. The cement cost alone is so high that wood chips don’t make sense It’s not worth the work to save $35 per yard cutting, chipping & mixing! In the ongoing analysis of buy vs build – Buy wins this race ! Well it’s the morning after. The first two experiments are pretty mushy – and puffed up like loaves of bread. The acid/alkali is definitely an issue. The other two, batch 3&4, with acid neutralized by lime are firm but not fully set. I’ll let them cure another 24 hours in the sun to see if they produce a usable material. My feeling is that for small jobs less than 4 yards, the chipcrete may be viable – presuming it cures to a product hard enough to walk on. Presuming the last two experiments cure, the high pH (alkali) means that the wood definitely will NOT rot. Each chip is encapsulated in a cement shell with a pH in the range of 10. 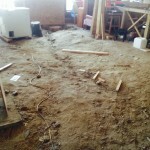 This is a very inhospitable environment for mold/yeast/fungus which would break down the wood. I guess this is why the europeans consider chipcrete a long-term 200-300 year building material. The idea of making a sitting room floor in a countryside out of saw, lime and cement had been ticking in my mind since a long time. In a place where I live, it rains cats and dogs and winners are extreme, i need a warm floor without much need for heating, the idea of earthen floor sounds little impractical. I have started to think on ur idea. Will drop a few pictures after the flooring is done. Do u have any ready flooring pics? I ended up using regular concrete because the ability to stain and moisture durability. My exterior test patches tended to fracture at the wood chip perimeters due to expansion and shrinkage from freezing. That said the test blocks I did from sawdust are still holding up after 3 years in the weather. They’re small and likely expand. If you’re going to use a wood product in your mix, sealing with something to limit seems a must to me.